Vinegar is really an all-star cleaning product. Eco-friendly natural cleaners. Vinegar, baking soda, salt, lemon and water in measuring cup on white background. Homemade green cleaning. With Earth Day in the spotlight April 22, you might be looking for a greener way to keep your home clean. As well as reducing exposure to synthetic chemical components, DIY products are great money-savers. 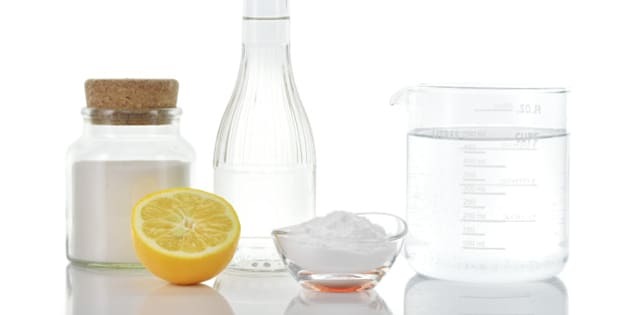 To get started making your own cleaning products, stock up on these five key ingredients: white vinegar, household soap, bicarbonate of soda, lemon and essential oils. Next, try mixing some of the following home-made cleaning products. Made from natural ingredients, these DIY recipes can easily replace commercially sold concoctions. Keep it simple by mixing a multi-purpose cleaning product for tiled surfaces (floors, bathroom and kitchen sinks, etc. ), laminate and melamine-finished surfaces, kettles, water jugs, etc. To a one liter bottle or container, add one tablespoon of bicarbonate of soda, one tablespoon of white vinegar and one tablespoon of the essential oil of your choice (lavender, rosemary, lemon or lime). Top up with a liter of hot water to dissolve all the ingredients. Close the lid and give the bottle a good shake to mix. The great thing about liquid black soap is that it doesn't need to be rinsed, so floors can be cleaned quickly and easily in one step. Fill a bucket with 10 liters of water then add three tablespoons of liquid black soap and two tablespoons of soda crystals. Then add a dozen drops of tea tree essential oil and a few drops of lemon or orange essential oil to give the mix a pleasant scent. To make natural dishwashing liquid, fill an old dish soap bottle (thoroughly washed) with 60 cl of liquid household soap (Castile soap, Marseille soap, etc.). Then add 15 drops of lemon essential oil, six drops of lavender essential oil and five drops of bergamot essential oil, plus one teaspoon of bicarbonate of soda. Shake well. Lemon is nature's ultimate antibacterial and odor-fighting agent. This makes it ideal for cleaning inside fridges. To get the best out of its properties, mix two tablespoons of bicarbonate of soda with the juice of half a lemon and five drops of lemon essential oil into a bowl of warm water. Black soap is a much cheaper alternative to industrially made products for dusting furniture. To make a liter of product, add a knob of black soap and five drops of eucalyptus or grapefruit essential oil to a spray bottle and mix thoroughly. Vinegar is the product of choice for green windows cleaning with smear-free sparkle. To make a half liter of window cleaning spray, mix 400 ml of white vinegar with 100 ml of water, then add five drops of tea tree or orange essential oil. Pour the mix into a spray bottle. First, buy a box of household soap flakes or, if you're feeling motivated, grate a bar of household soap. To make two liters of detergent, heat a liter of water then add 100g of soap flakes and three tablespoons of bicarbonate of soda. Mix until the flakes have fully dissolved then leave the mixture to stand for at least an hour. Pour the liquid into a storage container, top up with a liter of lukewarm water, then add a few drops of essential oil. Shake well. If the product still seems too thick the next day, it can be diluted with a liter of water. Switch the bicarbonate of soda for soda crystals to make laundry detergent for colors. Tip: keep old containers -- such as squeeze bottles, spray bottles and detergent bottles -- to use for your own concoctions.